A New Jersey Affidavit of Heirship is a simple form used to transfer property instead of going through probate when a person dies without a will. The New Jersey Affidavit of Heirship is the instrument of choice when all heirs agree to not probate the will. In most situations, the surviving spouse or children compose the affidavit to establish ownership of the community property owned by the deceased as long as the deceased’s children are the children of the surviving spouse and the property is not valued at an amount greater than the limits set by New Jersey state law. The New Jersey Heirship Affidavit is used by a local court in New Jersey to establish ownership of all personal and real property not identified by a will. A New Jersey Heirship Affidavit is recorded in official land records in the local county office. The Heirship process in New Jersey does not have to be initiated right after the passing of the decedent, however, it must be started within a few years after the person died. There must be no will and there must be no need for administration of the deceased’s estate. The determination of Heirship proceedings in New Jersey must be started in the county where the deceased lived, or in a county where the property of the deceased is located. If the decedent did not own any real property, then the proceedings may be started in the county where the decedent had personal property. 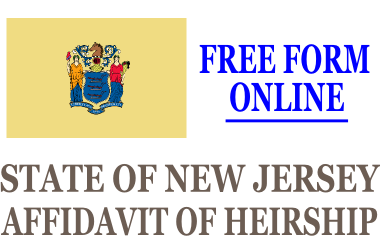 Fill out and print a free New Jersey Affidavit of Heirship form in just minutes online. The decedent did not owe any debts. The true identity of the family members and heirs. The person died on a certain date in a certain place. The witness will not gain financially from the estate. So, you can’t just grab a stranger on the street to witness a New Jersey Affidavit of Heirship, he or she must be disinterested in the estate. Afterwards, the New Jersey Heirship Affidavit must be signed by a notary public in the presence of the witnesses. An Affidavit of Heirship in New Jersey is used to expressly state the heirs of a deceased person. It is used to verify ownership of personal and real property. It is then recorded in official New Jersey land records to establish ownership. A decedent passes away without a will in New Jersey. The decedent has only one heir and owns a small parcel of real property. If the heir decides to sell the property, the heir obtains a New Jersey Affidavit of Heirship to record the deed to the estate. 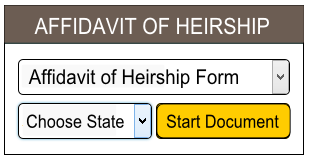 The witnesses of the Affidavit of Heirship in New Jersey should not be an heir of the deceased or someone interested in the estate. The New Jersey Affidavit of Heirship must then be signed by a notary public. The heir now legally owns and can sell the property. A New Jersey Affidavit of Heirship is a straightforward form that can be filled out quickly to transfer ownership of property to the heirs of a deceased person.